Our second release of Prototype is a beer style that is credited with being born in Vermont. 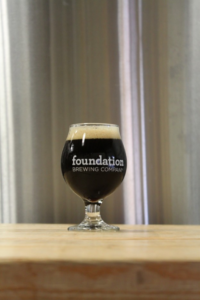 Often called a Cascadian Dark Ale on the West Coast, or an American Style Dark Ale by the Brewers Association, we prefer to call it a Black IPA because it gets right to the core of what the beer is about. Whatever you call the style, at its heart, this beer maintains the body and high impact hop profile of an American IPA, while simultaneously caressing it with the richness of dark roasted grains. Looking to balance and harmonize these intense flavors, we looked to the culinary world. There, we found the classic flavor pairing that was the final inspiration for this beer: Chocolate and Citrus. We built this Prototype on a malt base of pale, crystal, and chocolate malts, and used a blend of citrusy and fruity hop varieties layered throughout the boil, and again in the dry hop. The aroma of sweet citrus blooms from the glass. The first sip contains the expected upfront bitterness of an IPA, and then meanders through malt, citrus and fruit. Finishing smooth, light, and slightly chocolatey, this Prototype hides the 8% ABV. We had a blast making this beer, and hope you enjoy drinking it as much as we do. Cheers!